It seems no matter how strong my resolve to eat them all, there's always one banana left in the bunch that I forget to eat before it over ripens. Luckily there are so many uses for over ripe banana. Here's one of my favourites. 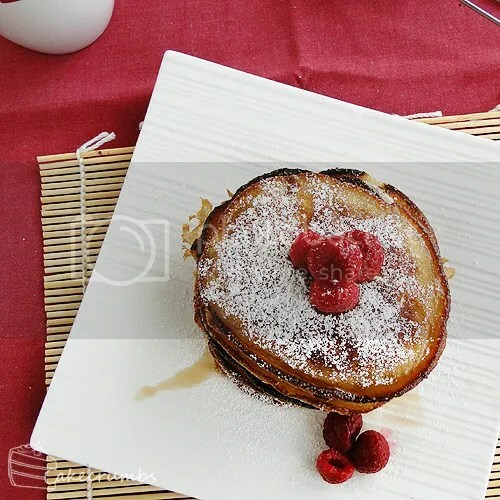 These pikelets have mashed banana and white choc chips folded through the batter. They're great as a dessert, as a snack or even as an indulgent breakfast. They're big on flavour, but not overly sweet, so they're great for any time of the day. The chocolate chips almost completely melt, so they add a hint of flavour, but it's subtle. On occasion, I've omitted the white choc chips when serving these for breakfast, or just because I had none on hand. They're delicious with and without them. 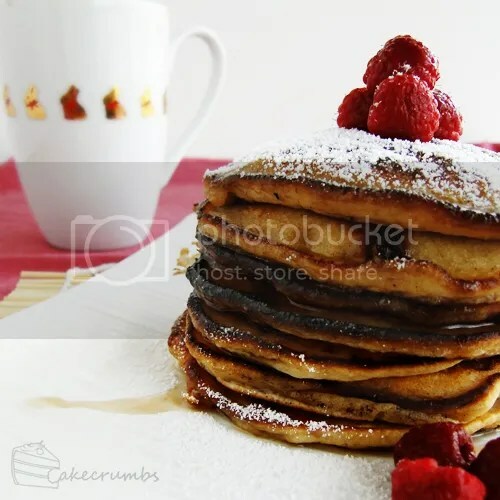 I topped these with icing sugar and raspberries and a drizzle of maple syrup, but the variations are endless. Pack them with fruit, sprinkle with cinnamon sugar, top them with icecream, layer them with strawberries and nutella for a naughty dessert, or just have them by themselves. This recipe makes 20-30 pikelets, depending on how large you make them. Combine banana, milk, sugar and egg; whisk until combined. Whisk flour in gradually until batter is smooth; stir in chocolate chips. Heat a large non-stick frypan over medium heat; spray with cooking oil or melt a small dollop of butter in the pan (I prefer to use butter). Pour small portions of the batter (1-3 tbsp) into the pan, depending on how large you would like your pikelets to be. If you have a small ladle or large dessert spoon, this is ideal for the job. Cook pikelets until bubbles appear in the surface; flip and cook until lightly browned underneath. When cooked, remove from heat and place on a dish; cover with aluminium foil to keep warm. Serve with desired topping. NB: if your batter is in a small/deep bowl, stir between batches to prevent your choc chips from sinking to the bottom. These were very indulgent. The photo is making want some more now. I just found the way to your blog via dA and this looks so delicious that I really want to try it out. It explains how to make your own.